Have you ever felt undervalued? Ignored? Overlooked? Three-time Edinburgh Fringe performer and Argus Angel Award-winner Lizzy Mace presents a series of endearingly awkward oddball underlings – from the fourth bear in the Goldilocks story to the disgruntled children’s TV presenter and her psychopathic sock puppets. Lizzy’s previous shows received 4- and 5-star reviews at the Edinburgh Fringe and Adelaide Fringe, and at Brighton Fringe 2012, Rom Com Con – written and performed with Juliette Burton – won an Argus Angel Award for Excellence and was ‘Top Nominee‘ for Best Comedy at The Latest Festival Awards. 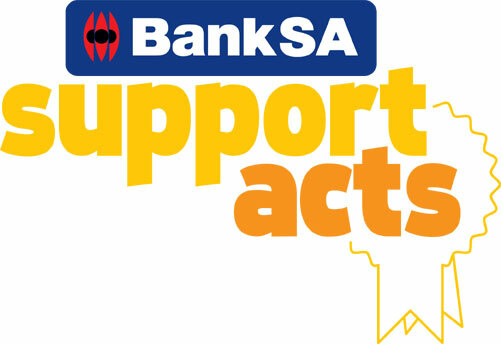 “You will surely be gasping with laughter” (Adelaide Theatre Guide). “Sketch comedy in the finest British tradition” (TalkFringe). After spending six weeks studying improvisation and sketch comedy writing at the legendary Second City Training Center in Chicago, Lizzy teamed up with award-nominated director Logan Murray to devise and develop her first solo hour of character comedy. 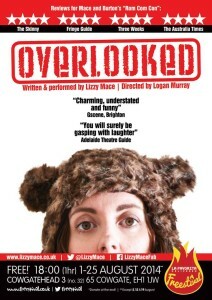 Following its world premiere at Adelaide Fringe in March 2014, Overlooked had its UK premiere in Brighton ahead of a full run at the Edinburgh Fringe in August. “Hilarious” (UKtheatre.net). “Charming” (The Latest). “Geeky” (Chortle). This is a FREEEEEE event! Visit the event page on the Fringe website here! Tickets: £6/ £5 (concessions). Buy tickets online here! Both Overlooked and Rom Com Con were selected for the BankSA Support Act scheme which helps get more people to see emerging artists through subsidised tickets on opening night and help with publicity. Yay!